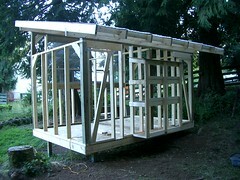 Thank you for stopping by DIY Chicken Coop Plans! Chickens are not too fussy. With a safe, dry roof over their heads, plenty of fresh water, full bellies, a place to get some exercise, and a bit of TLC, most will reward you with an abundant supply of tasty eggs (and more!). Chicken coops and runs, arks and tractors, eglus and kits - it can be a little overwhelming trying to determine which type of structure will provide the best environment for your birds. I know. I was once in your position, scratching my head, wondering just where to start. It is important to me that you are successful. That is why I will regularly be posting here, to give you the information you need to get off on the right foot. Finally, I will try not to go on my soapbox too much. However, if you have ever read about the living conditions of animals raised in commercial facilities, it's heartbreaking. The abuse they endure is not healthy - for us or for them. By erecting a chicken coop in your backyard, you are doing more than you know to help overcome this problem, while at the same time, providing your family with a source of natural, healthy eggs, your gardens with free fertilizer.